Italian jeweler and luxury goods retailer Bulgari (usually written "BVLGARI" in ancient Roman style) is named after its founder, Greek Sotirio Bulgari (Σωτήριος Βούλγαρης). The company was founded in 1884 in Rome, Italy. 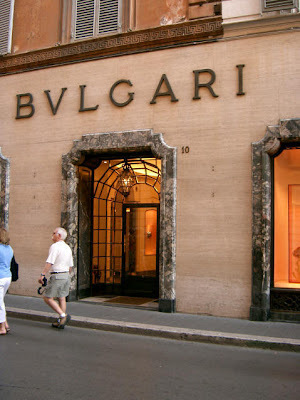 The current flagship store was opened in 1905 by Bulgari with the help of his two sons (Costantino and Giorgio) and it quickly became a place where the world's rich and famous came for the unique, high quality jewelry designs combining Greek and Roman art. Although the company made a name for itself with jewelry, today it is a recognized luxury brand that markets several product lines including watches, handbags, fragrances, accessories, and hotels. Bulgari opened its first international locations in New York City, Paris, Geneva and Monte Carlo in the 1970s. For many years the company maintained a showroom in New York's Hotel Pierre. 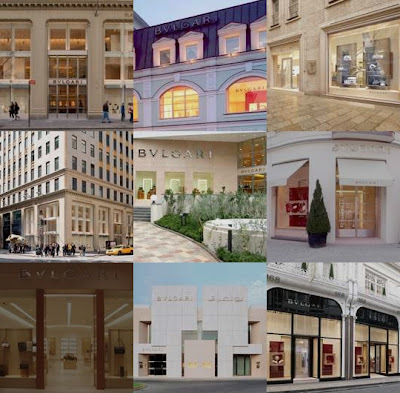 Today Bulgari has more than 230 retail locations worldwide. Bulgari jewelry design is unique, highly regarded and often imitated (and counterfeited). In the 1970s, many of the more expensive Bulgari pieces (such as necklaces, bracelets and earrings) were characterized by instantly recognizable, bold, almost brutal designs combining large and weighty gold links with black-surfaced steel. Genuine Bulgari items usually have a unique serial number that is registered with the company. However, Bulgari has only started to produce watches in the 1940's, and it was only in the 1970's that the Group made its debut in the fine watch-making sector, by introducing collections of watches to complement the creation and production of its jewels and silverware. In June 2000, Bulgari reached an agreement with The Hour Glass for the acquisition of 100% of Gerald Genta S.A., Daniel Roth S.A., Swiss leaders in high-end watch making, and Manufacture de Haute Horlogerie S.A., the owner of the related manufacturing facilities. 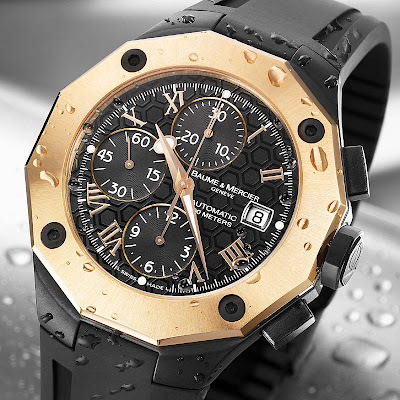 The Bvlgari acquisition gave rise to a new company named Daniel Roth and Gerald Genta Haute Horlogerie S.A. Combining the love of the craftsman with the demands of the master watchmaker, Baume & Mercier's creations express the elegance of luxury watch making. Recognized since 1964 by its signature PHI (pronounced as [fi]), the Greek golden number symbolizing divine proportion, a Baume & Mercier watch represents the fundamental values of superior quality in materials, craftsmanship, and love of detail and design. In 1830, Louis Victor Baume & Pierre Joseph Celestin Baume (whose family had been in the watch making business since the mid-1500s) had established the Baume Freres Watch firm in the Swiss Juna Region. Later, Baume Brothers was established in London in 1851. Then, Baume Brothers was renamed and became Baume & Cie in 1876. 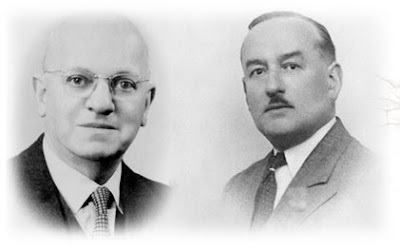 In 1918, William Baume (a grandson of the founder) met Paul Mercier (a Geneva jeweller of high repute) and created a business partnership. Baume & Mercier received the coveted Poinçon de Genéve, the highest honour given master watchmakers by the Republic and Canton of Geneva in In 1921. In 1930, Baume & Mercier SA Geneve became a registered trademark. In 1964, Baume & Mercier forms an alliance with Piaget Watch Company and Piget acquired the major shareholding in the company. 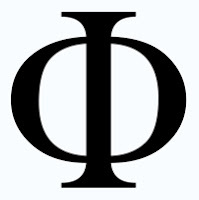 In the meantime, the Greek Phi symbol was introduced as their corporate emblem in the same year. It represents the brand's high standards of workmanship, attention to detail and commitment to quality. Over the years, Baume & Mercier created some of the most innovative technological breakthroughs in timekeeping. The development of the planetary rotor, a device that oscillates with the movements of the wrist to wind the watch and activate the mainspring, led to the production of the world's flattest self-winding watch. But Baume & Mercier's signature collection, the Riviera, the best known for its sophisticated elegance and still a best seller of today, is a 12-sided bezel with alternating satin-finish and polished link bracelet which has set it apart from other watches since its launch in 1973. Baume & Mercier's long-standing criteria of accuracy and design make it today a brand at the forefront of contemporary luxury. "Water" and "Paper" (by invitation only). For Tan Dun, water is a metaphor for the unity of the ephemeral and the eternal, the physical and the spiritual, as well as a symbol of renewal, re-creation, and resurrection. 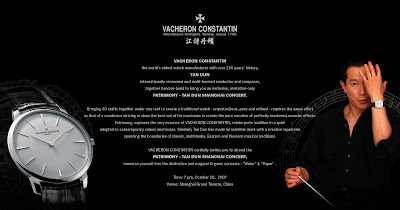 The use of a "Water-Instruments-Orchestra" is musical metaphysics, a powerful musical drama of Tan Dun's personal music journey. The metaphor is thus not limited to the water instruments. Rather, the expanded color and sound of the orchestra are driven by the water, but also spiritually inspired. In Tan Dun's Concerto for Water Percussion and Orchestra, one hears sounds central to the nature in which we live, but have too long not listened. Many instruments made for this piece, including the hemispherical transparent water basins which Tan Dun discovered in 1990, are hallmarks of Tan's longtime experimental voice and art installations: Jo-Ha-Kyu (1992), American Dream (1993), Ghost Opera (1995), The Gate (1999), and Water Passion after St. Matthew (2000). Among the other water instruments used in this work are water bottles, water tubes with foam paddles, water shakers, water drums (floating wooden salad bowls), water gong, water agogo bells, slinkyphone (the toy for children, with styrofoam attached to one end), and waterphone. 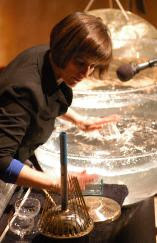 In addition to the percussive sounds created by instruments agitating water, the present water instruments can play a chromatic melody. For example, in the opening of the second movement, the soloist plays the same melody as the cello by using pitch bending in the water gong. This concerto is unique, in the way that Tan has put all the various forces in one piece. It is "alive," an ongoing work, especially in the cadenza sections, where the soloist improvises freely, never doing the same thing twice. This reflects Tan Dun's musical experiences in Taoist ritual, when he was a wild, barefoot "mountain boy" in his grandmother's village in the Chinese province of Hunan. 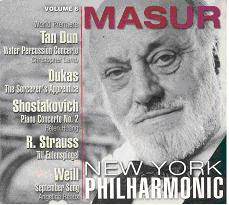 Concerto for Water Percussion and Orchestra - In Memory of Toru Takemitsu was commissioned by the New York Philharmonic for Kurt Masur and percussionist Christopher Lamb, and received its world premiere at Lincoln Center on June 3rd, 1999. LVMH Moët Hennessy-Louis Vuitton S.A., usually shortened to LVMH, is a French holding company and the world's largest luxury goods conglomerate. It is the parent of around 60 sub-companies that each manage a small number of prestigious brands. These daughter companies are, to a large extent, run autonomously. 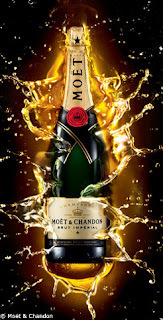 The group was formed after mergers brought together champagne producer Moët et Chandon and Hennessy, a leading manufacturer of cognac. 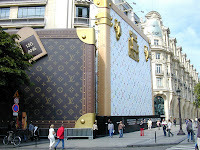 In 1987, they merged with fashion house Louis Vuitton to form the current group. 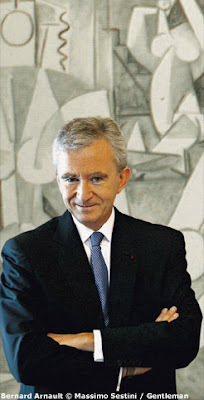 The group is partly owned by the Christian Dior group, and Bernard Arnault is Chairman and CEO of both companies. His successful integration of various famous aspirational brands into the group has inspired other luxury companies into doing the same. In 2001, De Beers launched a joint venture with LVMH (De Beers LV) in order to establish De Beers as a retail brand. The oldest of the LVMH brands is wine producer Château d'Yquem, which dates its origins back to 1593.